The Institute for Agro-Environmental Sciences (NIAES-NARO) Japan, is pleased to announce the publication of a new handbook entitled Handbook of Monitoring, Reporting, and Verification for a Greenhouse Gas Mitigation Project with Water Management in Irrigated Rice Paddies. The Handbook was planned as an action plan of PRRG and was cooperatively prepared by its members. The Special Section ‘Frontline research in mitigating greenhouse gas emissions from paddy fields’, which contains 10 original papers, has been published online by the Soil Science and Plant Nutrition (SSPN), in association with the GRA’s Paddy Rice Group, Partners and Affiliates. Paddy fields are recognized to be a major anthropogenic source of atmospheric methane (CH4), a potent greenhouse gas with a relatively short lifetime in the atmosphere. Like other biogenic sources, CH4 is produced by the activity of CH4-producing archaea, or methanogens, as one of the terminal products in the anaerobic food web in flooded soils. Due to the large amount of CH4 emitted globally from paddy fields, mitigation of emissions from this source is very important in order to stabilize its atmospheric concentration. In addition, because of the possibility of controlling these emissions by agronomic practices, such as management of water, fertilizer, and organic matter, paddy fields appear to be one of the most promising sources for mitigating CH4 emissions. The mechanisms and factors controlling CH4 production in flooded soils were systematically elucidated almost 50 years ago, mainly by laboratory experiments. Field measurements of the emissions from paddy fields have been conducted at various locations of the world since the early 1980s. Compilation of these data provided the emission and scaling factors for CH4 from rice cultivation in the 2006 IPCC Guidelines for National Greenhouse Gas Inventories. Trade-offs and synergies of mitigating CH4 emissions with N2O emissions or rice production have also been studied. As a result, an array of options that mitigate greenhouse gas emissions from paddy fields has now been proposed and demonstrated by field experiments. However, there is a strong social need, as the next step of research advancement, to develop implementation strategies for extending the options successfully to local farmers and communities. Because the systems of rice cultivation are widely diverse depending on climate, social, and economic conditions, the options often need to be developed in accordance with those regional conditions. Also, it is necessary to improve the sharing of knowledge of the mitigation options among researchers and other stakeholders, such as policy makers and land users, in different regions of the world. These endeavors are particularly crucial to set up nationally appropriate mitigation actions for rice producing countries, in order to undertake ambitious efforts to combat climate change and meet the 2016 Paris Agreement on Climate Change. This special section, ‘Frontline research in mitigating greenhouse gas emissions from paddy fields’, has been proposed to address the current research needs. Research papers on the issue were collected through the framework of the Paddy Rice Research Group of the Global Research Alliance on Agricultural Greenhouse Gases (GRA). The Paddy Rice Research Group’s Sub-America’s division met on 13-15 July this year in Stuttgart, Arkansas, USA. The meeting was attended by 10 GRA Member countries: Argentina, Brazil, Canada, Chile, Colombia, Indonesia, Japan, New Zealand, Uruguay and USA, and a meeting report will soon be available. The presentations for the meeting are now available in the Members’ Area of the website. 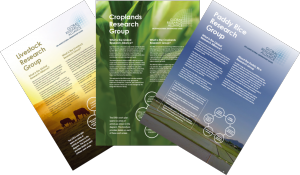 Three Research Groups of the GRA, Croplands, Livestock and Paddy Rice, have each produced an easy-to-read overview of their group activities and structure. Each of the brochures cover the six areas of work that the GRA focuses on: understanding the current research landscape, building capability, good practice guidance and methodologies, research networks and databases, collaborative research, and policy support & links to international initiatives. More information on each of the Research Groups can be found on the GRA website.